Born and raised in the Chicagoland area, Katie completed her Bachelors of Arts in English with a writing focus at Hope College in Holland, Michigan and earned her Masters of Fine Arts in creative writing at Roosevelt University in Chicago. Her poems have appeared in journals such as The Albion Review, After Hours Press, From the Depths (Haunted Waters Press), The Kelsey Review, Michigan Avenue Review, Our Time is Now, Outside In Magazine, Philadelphia Stories, Temenos, and Yellow Medicine Review. Her work also appears in the anthology Crossing Lines by Main Street Rag, and her debut chapbook, Prague in Synthetics, was published in February 2015 by Finishing Line Press. The poems contained in this chapbook are largely inspired by her experience with Western Michigan University's Prague Summer Program in 2005, for which she was a John Woods Scholarship Recipient. Katie has had the privilege of honing her craft under the guidance of writers including Jack Ridl, Rhoda Janzen, Heather Sellers, Alison Hawthorn Deming, Peter Cooley, Janet Wondra, and Frank Rogaczewski. She lives in Philadelphia where she is a professor of writing at Rowan University in Glassboro, New Jersey and at Community College of Philadelphia. Katie also currently serves as Editor-in-Chief of Glassworks Magazine. 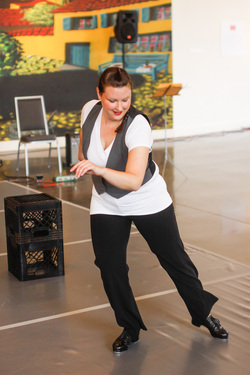 Katie launched her dance training in Chicago studying multiple forms and began cultivating her love for tap as a founding member of Footprints Tap Ensemble. She minored in dance at NASD accredited Hope College where she performed with InSync Dance Theatre, Michigan's only professional tap and jazz company. Katie's tap performance credits include Macy's Thanksgiving Day Parade, The Nutcracker on Broadway, Dance Chicago, Chicago Human Rhythm Project, Chicago Tap Theatre's Liason, City Hall Presents, and Cross-Rhythms, at which she performed a restaging of Manhattan Tap's seminal 1986 piece "Scrapple from the Apple" choreographed by founder Heather Cornell. Her choreography is performed regularly by The Lady Hoofers, and been featured in several high school productions and Footprints Tap Ensemble's annual Tap Jam. Her piece Unchain My Heart was selected for performance at the DanceUSA Conference in 2013. Katie has taken class with and performed alongside many tap greats including Jimmy Slyde, Teddy Levy, Dianne Walker, Heather Cornell, Roxane Butterfly, Sam Weber, Mike Minery, Jimmy Tate, Omar Edwards, Dormeisha Sumbry-Edwards, Ayodele Casel, Karen Callaway Williams, and Andrew Nemr. Her tap teachers and mentors include Sarah Cook Mason, Rosanne Mork, and Mark Yonally. She is currently Managing Director of The Lady Hoofers, Philadelphia's premier all-female tap ensemble, for which she also performs and choreographs.